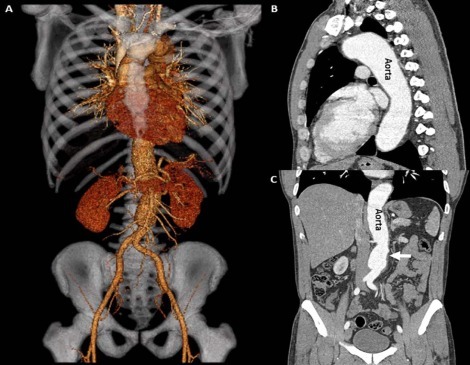 (A) Three-dimensional reconstruction of the computed tomography scan demonstrating aneurysmal dilation of the entire length of descending thoracic and abdominal aorta. (B) Computed tomography angiogram showing thoracic aorta aneurysm. (C) Computed tomography angiogram showing abdominal aortic aneurysm with a focal saccular aneurysm in the infrarenal part with periaortic stranding (arrow). A 33-year-old otherwise healthy man presented with worsening epigastric and flank pain for 3 weeks. He denied having vomiting, diarrhea, fever, urinary symptoms, or history of kidney stones. His vital signs were significant for a blood pressure of 140/72 mm Hg and pulse rate of 94 beats/min. Acute coronary syndrome was excluded by electrocardiography. A computed tomography scan of the chest and abdomen with contrast demonstrated aneurysmal dilation of the entire length of descending thoracic and abdominal aorta with the proximal descending thoracic aorta measuring approximately 4.8 cm in diameter (Figure). There was a focal saccular aneurysm in the infrarenal part with periaortic stranding suspicious for mycotic aneurysm, for which he was started on antibiotics. There were no stigmata of Marfan syndrome on physical examination, and serologic testing for syphilis was negative. His total cholesterol level was 144 mg/dL (reference: 140-199), low-density lipoprotein was 85 mg/dL (optimal: <100), and high-density lipoprotein was 41 mg/dL (optimal: >40). Vasculitic workup was negative. He was a bodybuilder by profession, and on further questioning, he admitted to 10-year use of anabolic androgenic steroids including stanozolol, oxymetholone, and testosterone, together with human growth hormone in cycles, which is the likely cause of his aortic aneurysm. His plasma testosterone level was low at 144 ng/dL (reference: 230-800), consistent with long-term exogenous androgen use. The infrarenal aneurysm was treated with resection and aortoiliac tube graft. Histologic examination showed dense adventitial fibrosis and lymphoplasmacytic infiltrate in the aortic wall. Anabolic androgenic steroids are a group of hormones that include testosterone and a set of synthetic testosterone analogs, clinically used to treat conditions such as reproductive organ dysfunction, breast cancer, and anemia.1 Because these drugs increase lean muscle mass and strength while promoting fat loss, professional bodybuilders, weightlifters, football players, and many more athletes abuse them. Moreover, their use is increasing among the general population, including high school students, who just want to “look good.”2 In a meta-analysis, the global lifetime prevalence rate of anabolic steroid use was found to be 3.3%, with men accounting for 6.4% and women accounting for 1.6%.1 There have been reports of acute myocardial infarction and aortic dissection with cystic medial degeneration of the aortic wall in young patients using these drugs.3, 4Although anabolic steroids promote atherosclerosis by increasing low-density lipoprotein and decreasing high-density lipoprotein cholesterol levels, which in turn predisposes to aneurysm formation and dissection, these were normal in our patient. The exact mechanism is not clear, but there is emerging evidence that androgen/androgen receptor signaling stimulates the initiation and progression of aortic aneurysm. Androgen receptor is thought to modulate aneurysm formation through inflammation and fibrosis mediated by interleukin 1 alpha and transforming growth factor beta, respectively.5 It is important to raise awareness among the general population about these potentially life-threatening complications of anabolic steroid use.